The WMenu widget offers menu navigation. Typically, a menu is used in conjunction with a WStackedWidget (but can be used without too), where different 'contents' are stacked upon each other. 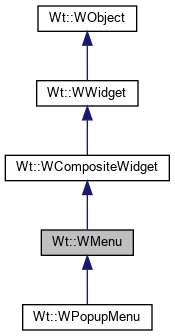 Each choice in the menu (which is implemented as a WMenuItem) corresponds to a tab in the contents stack. The contents stack may contain other items, and could be shared with other WMenu instances. When used without a contents stack, you can react to menu item selection using the itemSelected() signal, to implement some custom handling of item selection. // add four items using the default lazy loading policy. After contruction, the first entry will be selected. At any time, it is possible to select a particular item using select(). Each item of WMenu may be closeable (see WMenuItem::setCloseable(bool). Like selection, at any time, it is possible to close a particular item using close(). You can react to close of item by using the itemClosed() signal. The WMenu implementation offers fine-grained control on how contents should be preloaded. By default, all contents is lazy-loaded, only when needed. To improve response time, an item may also be preloaded (using addItem()). In that case, the item will be loaded in the background, before its first use. In any case, once the contents corresponding to a menu item is loaded, subsequent navigation to it is handled entirely client-side. The WMenu may participate in the application's internal path, which lets menu items correspond to internal URLs, see setInternalPathEnabled(). The layout of the menu may be Horizontal or Vertical. The look of the items may be defined through style sheets. The default WMenuItem implementation uses four style classes to distinguish between inactivated, activated, closeable inactivated and closeable activated menu items: "item", "itemselected", "citem", "citemselected". By using CSS nested selectors, a different style may be defined for items in a different menu. You may customize the rendering and behaviour of menu entries by specializing WMenuItem. The menu is rendered as a <ul>. Unless you use the bootstrap theme, you will want to customize the menu using inline or external styles to hide the bullets and provide the appropriate horizontal or vertical layout. Creates a new menu (deprecated). Construct a menu with given orientation. The menu is not associated with a contents stack, and thus you will want to react to the itemSelected() signal to react to menu changes. the orientation parameter is ignored, since menus are now always rendered using <ul> elements, and CSS will determine the orientation. Use WMenu(WContainerWidget *) instead. The menu is not associated with a contents stack, and thus you will want to react to the itemSelected() signal to react to menu changes. Construct a menu to manage the widgets in contentsStack, and sets the menu orientation. Each menu item will manage a single widget in the contentsStack, making it the current widget when the menu item is activated. the orientation parameter is ignored, since menus are now always rendered using <ul> elements, and CSS will determine the orientation. Use WMenu(WStackedWidget *contentsStack, WContainerWidget *) instead. Construct a menu to manage the widgets in contentsStack. Use this version of addItem() if you do not want to specify an icon for this menu item. Adds a menu item with given contents, which is added to the menu's associated contents stack. or, you may have one or more items which which are not associated with a contents widget in the contents stack. Adds an item with given text, and specify a slot method to be called when the item is triggered. The target and method are connected to the WMenuItem::triggered signal. Adds an item with given text and icon, and specify a slot method to be called when activated. Adds a menu item. Use this form to add specialized WMenuItem implementations. Adds a submenu, with given text. Adds an item with text text, that leads to a submenu menu. Adds a submenu, with given icon and text. Adds an item with given text and icon, that leads to a submenu menu. Adds a separator the menu. Close the menu item item. Only closeable items can be closed. Menu items in a menu with N items are numbered from 0 to N - 1. Use this version of insertItem() if you do not want to specify an icon for this menu item. inserts a menu item with given contents, which is inserted to the menu's associated contents stack. inserts an item with given text, and specify a slot method to be called when the item is triggered. inserts an item with given text and icon, and specify a slot method to be called when activated. Inserts a menu item. Use this form to insert specialized WMenuItem implementations. inserts a submenu, with given text. inserts an item with text text, that leads to a submenu menu. inserts a submenu, with given icon and text. inserts an item with given text and icon, that leads to a submenu menu. Handling of internal path changes. This methods makes the menu react to internal path changes (and also the initial internal path). You may want to reimplement this if you want to customize the internal path handling. Returns whether the menu generates internal paths entries. Returns whether the item widget of the given item is disabled. Returns whether the item widget of the given index is disabled. Returns whether the item widget of the given item is hidden. Returns whether the item widget of the given index is hidden. Returns the item by index. Signal which indicates that an item was closed. This signal is emitted when an item was closed. It is emitted both when the user closes an item, or when close() was invoked. Returns the list of menu items in this menu. Signal which indicates that a new item was selected. This signal is emitted when an item was selected. It is emitted both when the user activated an item, or when select() was invoked. Signal which indicates that a new selected item is rendered. If you are unsure what is the difference with the itemSelected signal, you'll probably need the latter instead. Returns the index of the item to be selected after hides. Returns the index of the item to be selected after the item with given index will be hidden. By default, if the given index is an index of currently selected item, returns an index of the first visible item to the right of it. If it is not found, returns the index of the first visible item to the left of it. If there are no visible items around the currently selected item, returns the index of currently selected item. You may want to reimplement this if you want to customize the algorithm of determining the index of the item to be selected after hiding the item with given index. The orientation is set at time of construction. this function no longer has any use and will be removed. This is the item with which this menu is associated as a submenu (if any). Removes the given item. The item and its contents is not deleted. Returns whether the menu is rendered as an HTML list (deprecated). Select the menu item item. When item is 0, the current selection is removed. Using a value of -1 removes the current selection. This is the internal function that implements the selection logic, including optional internal path change (if changePath is true). The latter may be false in case an internal path change itself is the reason for selection. Disables the menu item item. Only an item that is enabled can be selected. By default, all menu items are enabled. Hides the menu item item. By default, all menu items are visible. If the item was currently selected, then the next item to be selected is determined by nextAfterHide(). This function no longer has an effect, as a menu is now always rendered as a list.